‘Powerlock‘ is a genericized term for single pole electrical powerlock connectors used for high current electrical application and assemblies. Industrial power plugs can be used for single phase and three phase applications up to 800A. Electrical circuits for three phase connections require five separate power cables (or four if Neutral is not required). Originally developed in the UK by Litton Veam in the mid-1990s, powerlock connectors are industry standard for electrical connections used on power generators and other appliances. Power industry experts often use the term ‘powerlock’ as industry jargon. 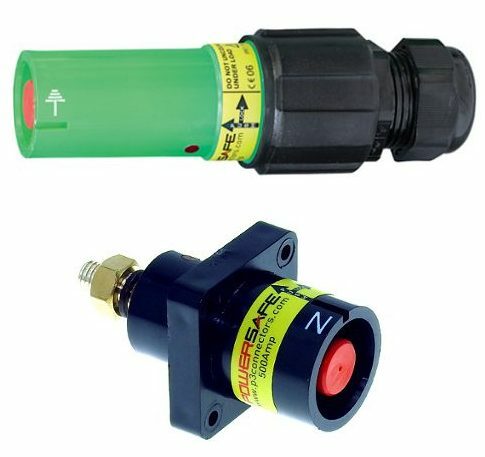 In the early 2000’s, the original Powerlock design team split from Litton connectors, subsequently, the team decided to enhance and enrich their initial designs to birth the Powersafe connector. Litton connectors are available in 400A and 660A, while Powersafe connectors are rated to 500A and 800A. Powersafe was manufactured with a special pole that has more contact bridges, hence allowing for higher current connections (1000V AC). 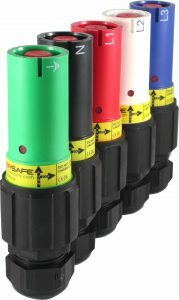 Powersafe improvements include specification enhancements such as: increased current carrying capacity (500A/800A), increased short circuit ratings (35.5Ka), reduced insertion force, improved impact resistance, UL Listed, rubber hand grip for ease of coupling and cable strain relief for cable sized between 25mm-300mm. What are Powerlock Connectors used for? Single pole power connectors are used for electrical power connections. Multi-pole connectors (i.e Molex) would be impractical to handle due to size, weight and cable bend radius, therefore powerlock plugs are used. Typical uses for powerlock devices include connecting temporary power generators and fixed power sources in venues where high-powered temporary equipment is used. Powerlock inputs are available on many large dimmers and on large power distribution units, as a result they are standard in the event sector. A range of Powersafe connectors that attach directly to ‘busbars‘ are available. Network connection devices can be used for drawing off power for temporary installations, or for feeding power into ‘busbars’ in situations such as temporary generator hook-ups during power outages. Powerlock plugs have safety features that help to protect the user against potentially fatal electric shock. Improved safety features can help avoid errors that are common with CamLock, so the plugs are considered safer for industry use. Powerlock connectors are designated as inline source (male) or inline drain (female). Line source connectors are intended to have their permanent connection in the direction of the source of electrical energy up to 660A-800A, therefore male source connectors have a male pin to insert into a panel mount. Safety is not compromised because the gap between the plastic insulating cap on the male pin of the source connector and the surrounding plastic housing is too small to insert a human finger. Line drain connectors have a female receptacle on the insert, therefore female devices are intended to have their permanent connection in the direction of equipment receiving power. Female drain connectors have a spring-loaded plastic cap to prevent dirt ingress and casual contact with the electrical metalwork. How do you terminate a powerlock connector? Powerlock assembly procedure has been devised to show step-by-step how to terminate copper cables up to 300mm². For a satisfactory termination it is essential that the recommended assembly procedure is used from the assembly guide to terminating powerlock connectors. Powerlock power connectors are similar to CamLock connectors (Cam-Lok), although they are considered much safer. CamLock is considered particularly dangerous, consequently CamLock has been banned across Europe. CamLock are often referred to as ‘suicide connectors’ because of the exposed contact points and ability to easily disconnect under load, therefore Cam type plugs are now considered bad practice. Exposed single pole plugs are still used in some places across the USA because it has been used for decades. 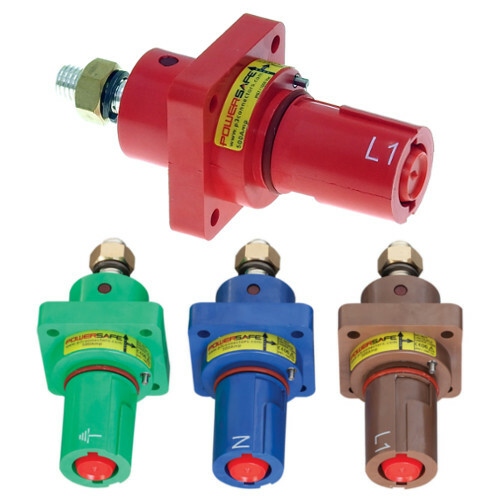 Powerlock Boxes are Sequential mating units that assist with the safe and controlled connection of the single core power cables like H07RN-F. Distro boxes control the sequence of connection to ensure Earth and Neutral connections are mated before phase connections can be made. Sockets on the boxes have improved safety levels by eliminating connection errors and ensuring safety circuits are always connected. Powersafe boxes feature a locking mechanism which requires the use of a special tool to disconnect, making them safer for low voltage application. 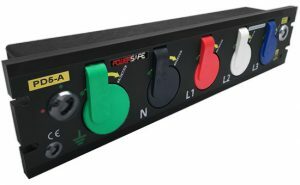 The Powersafe Sequential Mating Box is a three phase power distribution board designed for use on temporary electrical installations with a current rating of up to 800 amps. A sequential mating box has three phase sockets for all three live electrical lines, plus Neutral and Earth. Powerlock industrial plugs are available in colours to match international wiring colour standards. Colours are allocated for connectors in the UK, Europe, Australia and North America. The mechanical keying system is independent of the colour coding, for example, a blue connector intended for a neutral connection in Europe will not connect with a blue connector intended for live connection in North America.